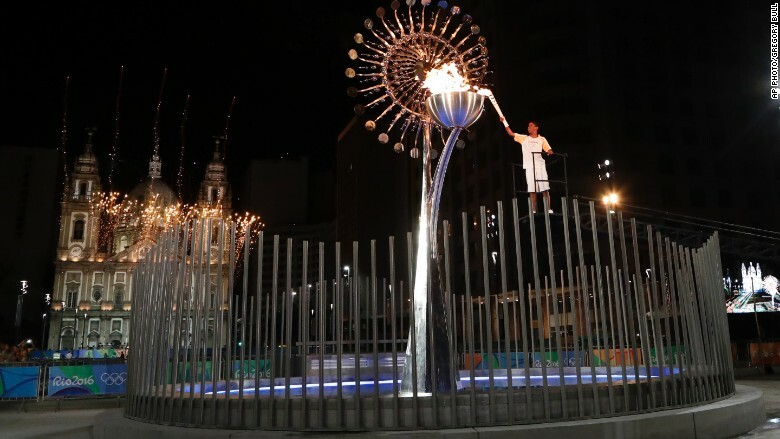 Jorge Alberto Oliveira Gomes lights the Olympic cauldron during the opening ceremony of the 2016 Summer Olympics in Rio de Janeiro, Brazil, Saturday, Aug. 6, 2016. The negative publicity leading up to the Rio Olympics fostered a sense of both anticipation and apprehension surrounding the Games. So the organizers and NBC were doubtless relieved to see the opening ceremony mounted without a significant hitch -- that is, other than its ponderous pace and bloated duration. Granted, the festivities followed a pretty familiar template, which, loosely translated, amounted to an extensive history of Brazil through song, interpretive dance and dazzling projected images. That said, the staging, and especially the parade of nations, dragged on interminably, swallowing five hours of airtime. "Are we at Timor-Leste already? This is flying by," NBC's Matt Lauer said at one point, presumably in jest, since it was certainly not. Yet if the ceremony didn't provide the sort of shock-and-awe campaign delivered by the Russians, or the cast of thousands employed by the Chinese, South America's first Olympics was more than enough to get the job done. From the opening sequence, which looked like something out of "Tron," to the giant rigged bugs that represented life in the Amazon, the show maintained Olympic tradition by at times resembling a Las Vegas revue on steroids. In a way, some of the smaller flourishes, like supermodel Gisele Bundchen strutting across the stadium floor to "Girl From Ipanema," offered more of a wallop than the pyrotechnics. The ceremony also incorporated what felt like an extended public-service announcement, citing the peril of global warming. The fact that yielded indignation in social media circles in the U.S. probably says more about this country's partisan politics -- presently as toxic as the water Olympians will have to swim in -- as anything else. Not surprisingly, NBC's coverage accentuated the positive, acknowledging concerns that have dogged Rio but stressing Brazil's unique charms, along with its desire, as co-host Meredith Vieira said, to "put the headlines aside, [and] hit the reset button." The network also generated instant criticism, with complaints about the abundant commercial breaks and the delayed presentation. It is true that if ever an event cried out for using a DVR to zap past the ads, this was it. Frankly, though, such griping requires a degree of amnesia. TV long ago determined that the Olympics can be shaped into an up-close-and-personal variety show in which the produced elements at times overwhelm the competition, at least until the major events to kick in. For all that, the underlying ideal of the Olympics -- and the beaming faces of athletes from around the world streaming into the venue -- is a strong tonic against cynicism. That peaked with the warm greeting given to the team of refugees that will compete. Besides, even in the slower moments, there are worse things than having Lauer regale Americans with international trivia every two years.